Production began following the marriage of Ishigoro Takeyari, a farmer and trader in the Kojima region, and Ume, an accomplished weaver, and this marked the beginning of Takeyari’s history. 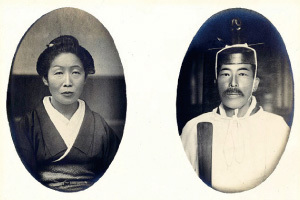 Ume, who was known locally as an excellent weaver, began to receive orders for kakuobi (stiff sashes for men) and soles for tabi (a type of Japanese sock) from cotton merchants that had heard of her reputation. As time passed, Takeyari fabric was taken in boxes made of paulownia wood and entered into expositions and competitive exhibitions in Osaka and Tokyo, where it won awards. 2代目卓衛の時代に”手織りから動力織機”に切り替える事により生産増加への布石を築きます。動力を水車から蒸気機関へ、織機を手織りから動力織機へと切り替えるとともにそれまで生産の中心だった足袋底用布も帆布へと移行していきました。During the time of Takuei, the second generation, production moved from hand-weaving to power looms, which laid the foundation for increased production. 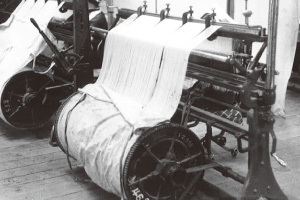 As the power source moved from water wheels to steam engines and looms moved from manual to powered, production moved from a focus on fabric for use in tabi soles, as it had been, to a focus on canvas. 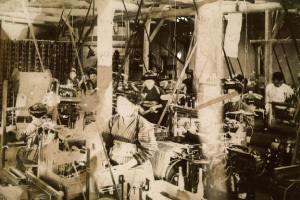 Takeyari shifted quickly to textiles for export, and the company was commended as an excellent export textile factory. 他社では織ることのできない極厚の1〜3号の帆布を生み出すことができた。The “Takeyari Textile Factory” was established at its current location. Kazuo, the third generation, introduced picanol shuttle looms made in Belgium, and this allowed the company to produce extra-thick No. 1~3 canvas, which other factories were unable to weave. he scale of production increased to 260,000 meters of fabric per month, including synthetic fiber and cotton fiber. 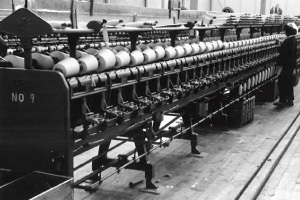 nd increased the speed of growth by promoting the introduction of super high-speed looms. 社名変更　武鑓織布株式会社から、株式会社タケヤリへ。The company name changed from Takeyari Textile Co. Ltd. to Takeyari Co., Ltd.
株式会社タケヤリ、丸進工業、帆布協同組合の３社が統一ブランド「倉敷帆布」の企画・開発・販売を行う「株式会社バイストン」を設立しました。「バイストン」はタケヤリの創業者、梅（バイ）石五郎（ストン）の名を組み合わせて名付けられています。分家であるバイストンでの試みは新たな方向性の提示へと繋がっていきます。Baistone Co., Ltd. was formed so that the three companies of Takeyari Co., Ltd, Marushin Kogyo Co., Ltd. and the Canvas Cooperative Association could plan, develop and sell products all under the same brand, “Kurashiki Canvas.” The name Baistone was created by combining alternate pronunciations of the characters used to write the names of Ishigoro and his wife Ume, the founders of Takeyari. An attempt at Bistone, a branch family, led to revealing new directions for the companies to take. ５代目の澄治会長自ら陣頭に立ち、これまでの生産工場という立場から自社のファクトリーブランドを設立したいとの想いから、新しい一歩を踏み出しはじめます。現在では、タケヤリの機屋としての特徴を生かした「TAKEYARI since1888」「UNDER CANVAS」「壱等雲斎」の３つの自社ブランドを展開しています。また、オリジナル生地の開発、OEMに至るまで展開を広げています。With Sumiji, the fifth president, personally taking the lead, the company has begun taking steps to move from being a production factory, as it had been, toward establishing the company’s own factory brand. Currently, the company is developing three personal brands that make use of Takeyari’s characteristics as a weaver: “TAKEYARI since 1888,” “UNDER CANVAS” and “ITTO UNSAI.” In addition, the company is developing original types of fabric, and expanding operations to OEM.